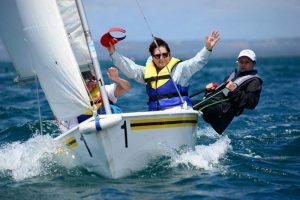 In 2016 Donaghadee Sailing Club were the first Club to offer the WOW programme, giving the opportunity for ladies to have some fun social sailing in the presence of a female instructor. Our programme can be run in a variety of boats varying from the very stable Laser Stratos keel boats to singlehanders. As part of the RYA NI’s Active Clubs Initiative “The WOW programme is a fantastic opportunity for women to get out on the water and learn how to sail. WOW focuses on the social aspect of sailing rather than being competitive so it will be a great way to meet new people as well as having fun and keeping fit! After a warm shower adjourn participants are encouraged to retire to the Clubhouse bar for a well-deserved coffee or a drink and learn about what the Club has to offer. WOW3 Sunday afternoons – 4th, 11th, 18th and 25th August. 1pm to 4pm. Sessions can be booked and paid via our online booking system. See upcoming courses in this category on the right hand side of the page.